Please consider giving of your time. Volunteers are needed to provide one-on-one support, answer the help line, staff the shelter facility, assist families through the child advocacy center, plan and assist in fundraising and awareness events, educate the public through speaking engagements, provide office support, and many other areas. For more information, contact our administrative office at 316-803-1800 or complete the Volunteer Application on this website. Check out our Volunteer Opportunities List for the many different ways that you can get involved! 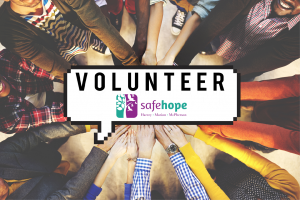 Safehope will be having a Volunteer Training on Friday, September 7th from 6pm-10pm, which will continue on Saturday, September 8th from 8am-4:30pm. Come learn more about how you can support survivors of domestic violence and sexual assault by becoming a volunteer! We have many different opportunities for individuals or groups to get involved! Please RSVP by August 31st to reserve your spot! To RSVP or for any questions, please contact 316-803-1800 or email volunteer@safehope.net. Light meals will be provided for both days of training. We look forward to seeing you there!! A: Safehope has opportunities for women and men, survivors and non-survivors. Volunteers must be at least 18 years of age, in some instances have access to transportation and/or a phone, be sensitive to issues of domestic and sexual violence, and have effective communication and listening skills. We so greatly appreciate the amazing passion, dedication and skill that Safehope volunteers bring to the organization and to the work we do in the community! Q: What opportunities does Safehope have for volunteers? A: Safehope has several opportunities for people interesting in serving their community. You can get involved in direct services to victims, awareness and prevention efforts, fundraising, or agency support.